I've always been a huge fan of Soap & Glory. I swear I own about thirty of their products; I just can't get enough of them. I've been hooked ever since they launched years ago and I still continue to be wowed by their products. There's just something about them; they all smell delicious, the packaging is amazing, the names of all of the products are awesome and fun and basically, they can't do a foot wrong in my eyes. But besides the fact they look/smell/sound good, they actually are amazing products. I'm pretty sure I've gushed over them many a time on this blog however, so I'll get down to the review! 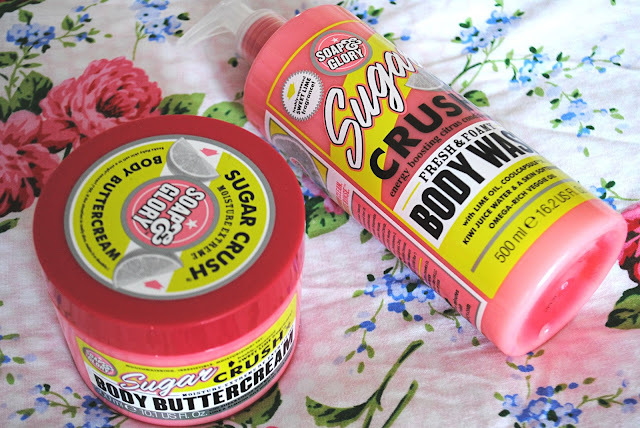 When Soap & Glory launch a new product, I'm always dying to get my mitts on it, even if it is just to add it to my ever-expanding collection. 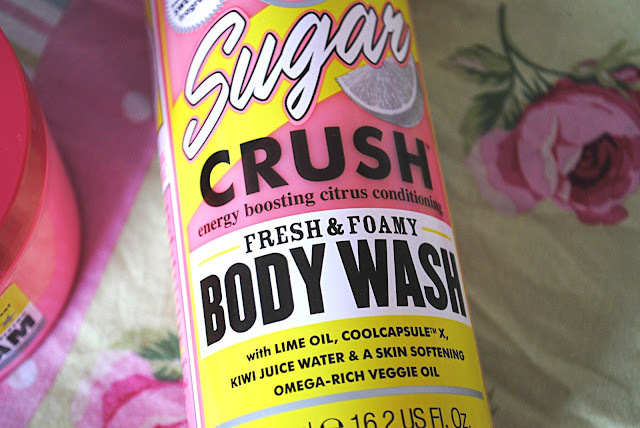 I was recently sent their new(ish) Sugar Crush body wash and butter and was really intrigued to see what they'd be like. The 'sweet lime' fragrance is definitely a step away from their usual sweet buttery scents, and probably isn't one for the faint-hearted, but I actually really love it. It's a very distinct refreshing smell, and it definitely invigorates and energizes; which makes the body wash perfect for waking yourself up in the shower in the morning. The body wash has the same creamy consistency as their other shower gels; it is really moisturising, foams up when in contact with water, and most definitely nourishes the skin with omega-rich veggie oils. For £6.50 you get a massive big bottle of it, which is sure to last absolutely ages! 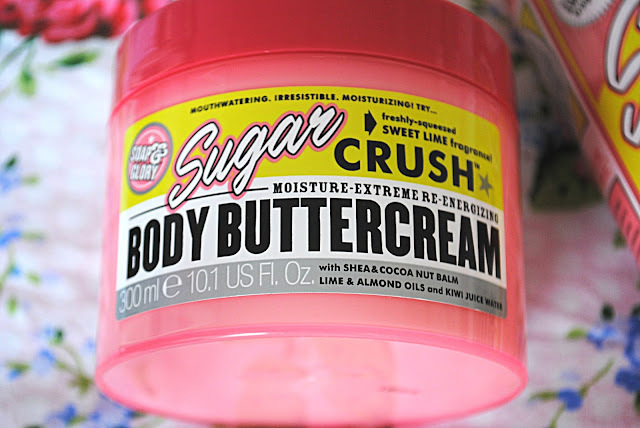 The body buttercream is just as lovely. It smells the same, so a slightly tangy sweet lime fragrance, and is a seriously thick and indulgent body cream. It's similar to their other body butters in that it's SO moisturising and thick, although I'd actually say it's thicker than the majority of butters they have. It contains shea and cocoa nut balm, adding to its super-nourishing properties, as well as lime and almond oils and kiwi juice water. Mhmm! It definitely keeps my skin nice and moisturised, as well as having a really fresh, energizing scent. It retails at £10.50. Overall I'm really pleased with these products, but I would definitely recommend giving them a smell before you try, as the fragrance is really unique and I have a feeling it won't be everyone's cup of tea! 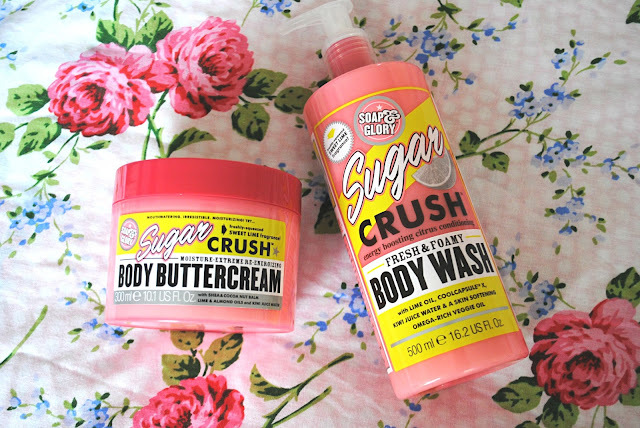 Do you love Soap & Glory products?